Ambipom in game: 245 Who? Important notice! 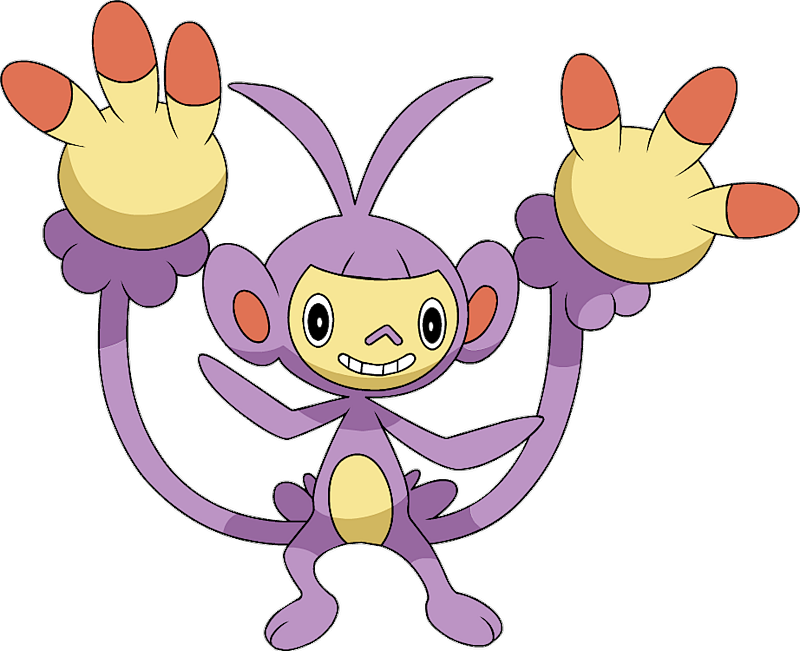 Pokemon Ambipom is a fictional character of humans. Ambipom (Japanese: ???—? Eteboth) is a Normal-type Pokémon introduced in Generation IV. Ambipom can leap from tree to tree with brilliant speed. To eat, it deftly shucks nuts with its two tails. As it has two hands on its tails, it rarely uses its arms. Ambipom works in large colonies in heavily wooded areas and makes rings by linking tails with another Ambipom, apparently in friendship. 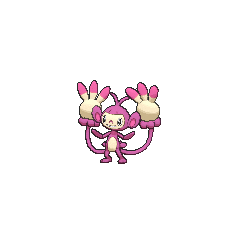 It lives along with its young, Aipom. 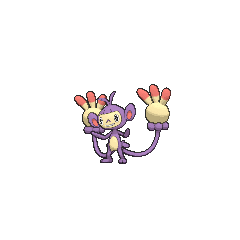 Dawn's Aipom, formerly Ash's, evolved into an Ambipom in Journey to the Unown!. Upon evolving, she matured greatly and became one of Dawn's most talented Pokémon, being used in many of her Contests. She was later given to O in To Thine Own Pokémon Be True! to train to become a ping pong champion at his training center in Vermilion City. A couple of Ambipom could be seen living in the Azoth Kingdom in Volcanion and the Mechanical Marvel. 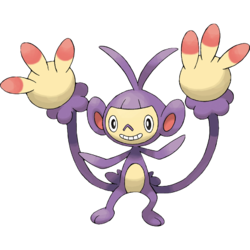 Gold's Aipom, Aibo, evolved into an Ambipom prior to his battle with the legendary Arceus. However, as the story moves back to a few weeks before the fight, it wasn't until several rounds later that its evolution was finally shown on-screen. 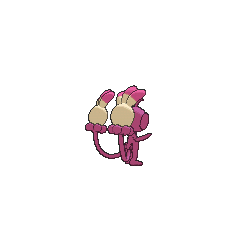 This event, however, distressed Togebo, being the only Pokémon on his team that was in its basic stage. 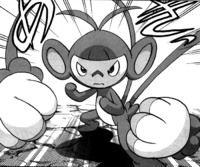 Ambipom appears to have been based on a monkey, with an exaggerated concept of a prehensile tail. It may be specifically based on the squirrel monkey, which is similar in appearance, and also shares its large smile with cymbal monkeys. Eteboth may be a combination of ?? eteko (monkey), ?? ete, meaning strong point, and both, possibly referring to the ambidextrous nature of the hands on its tail.